CD subjects with ATG16L1T300A genotype (T300A) were more susceptible to cigarette smoking–associated Paneth cell defects. (A) In a cohort of CD subjects (n = 186) who underwent ileocolectomy, 126 received postoperative prophylaxis. 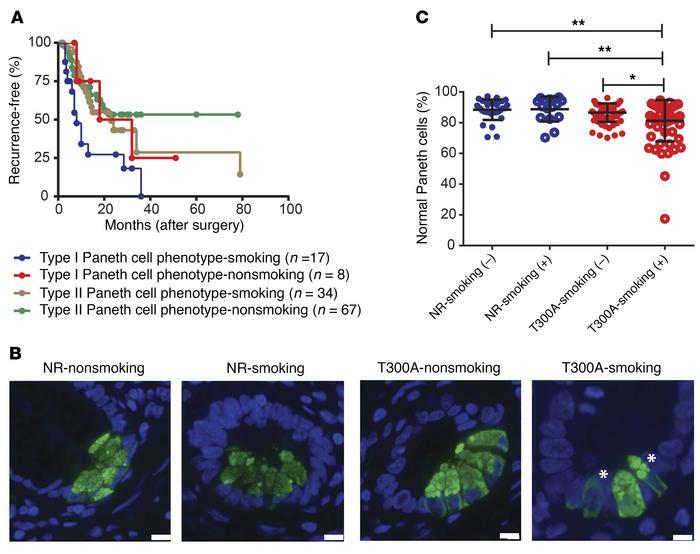 Within this prophylaxis subset, smokers with type I Paneth cell phenotype (<80% Paneth cells with normal granule morphology) showed the shortest time to disease recurrence (P = 0.0183 by log-rank test). (B) Representative HD5 immunofluorescence. Scale bar: 10 μm. Asterisks indicate abnormal Paneth cells. (C) Cigarette smoking was associated with lower percentage of normal Paneth cells in patients with ATG16L1T300A allele or alleles, while no significant differences in Paneth cell defects were seen between NR patients with or without smoking history (overall P =0.001). NR-nonsmoking, n = 25; NR-smoking, n = 14; T300A-nonsmoking, n = 84; T300A-smoking, n = 62. Data were analyzed by Kruskal-Wallis test followed by Dunn’s multiple comparison tests between groups and represent mean ± SEM. P values for comparisons between groups are shown in Supplemental Table 2. *P < 0.05; **P < 0.01.